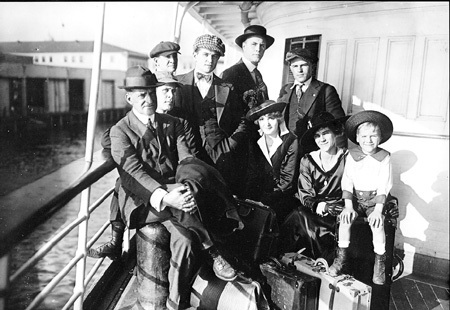 Thanhouserites aboard ship en route to Jacksonville, Florida, sometime after mid-December 1915. Motion picture denomination of the drama was forecast by Edwin Thanhouser in a discussion yesterday of his part in the making of films for the new Mutual program and the progress of the industry in general. "The time is near at hand," declared Mr. Thanhouser, "when the speaking stage will look to motion picture plays for material, absolutely reversing the condition which has prevailed." In the course of his conversation Mr. Thanhouser unfolded plans for the making of films in the palmy tropics and the frozen north. He announced that on December 1 a new studio at Jacksonville, Florida would be ready for operation, and about that time at least two companies would be sent north into the Hudson's Bay country. "Florida is practically virgin territory for motion picture purposes," he said, "as compared with other regions which have earlier attracted the attention of motion picture makers. With the Florida studio as a base, we expect to make pictures up and down the coast of Miami, Savannah, through the West Indies and the Bermudas. Note The Jacksonville studio is located near the center of things here, yet it is within easy range of desirable outside locations. It is a point of considerable advantage to a manufacturer located in New York. It is a short run there, and I can keep closely in touch with operations without being separated too far from the plant at New Rochelle. "The same condition to a degree will apply to the companies sent into the North. Meanwhile, operations will continue as usual at the plant in New Rochelle, where a great deal of new equipment has been installed and many improvements have been made. Our cameras will be working in three zones, the north temperate, the arctic and the tropical. These important moves represent the persistent effort of the Thanhouser Corporation to develop that most vital element of the motion picture - realism. I am finding it desirable and necessary to amplify our field of operations to keep pace with the destiny of the film drama. The development of the film drama towards realism I consider the most important thing before the makers and exhibitors of film today. It is one of our many vast advantages over the speaking stage. "There are yet developments in the motion picture to come before we can say that it is a perfect thing. We can, however, expect nothing that is more perfect than nature itself, and the realism of the motion picture as it stands today is beyond betterment, except in minor details. We may see improvements which will result in perfect color rendition, we perhaps shall get better modelling of images through stereoscopic effect, and we may attain certain other refinements of the picture mechanically, but the big field of development in the art of the picture cannot be more broadly defined. "It is with a full recognition of this vast importance of the motion picture and its artistic as well as its commercial future that the operations of the Thanhouser studios in making releases for the Mutual Film Corporation are directed. I feel highly responsible to the millions of persons who daily see our releases on the Mutual program. We owe them the best that is in us to produce and we always work with that end in view. That is why we are going to a very heavy expense of money and effort to invade the tropics and the Canadian wilds - simply to make better, more worthy pictures. "Our responsibility is as great, both to the public and to our own future, as if the printing press had just been invented and we were given control of so large a portion of the output of published matter for the information and entertainment of the millions. This means that we must pay heed to every factor that goes into the making of pictures. It explains why we have enlarged and improved our New Rochelle plant, putting in costly developing, printing and perforating machinery, a better ventilating system, additional factory space, better studio arrangements, and the like. It is the reason behind the big investment in Jacksonville. It explains why we are holding and continually building up a remarkable organization of actors and directors. "I think that we have a wonderful roll of stars. Florence LaBadie, Mignon Anderson and Gladys Hulette, all appearing in Than-O-Plays for the Mutual program and the Thanhouser Masterpictures. Do you know it is a fact that Miss LaBadie's mail is often as big as the Thanhouser Corporation's mail? Why, only the other day she received 1,300,000 votes in a newspaper film star popularity contest in which she was voluntarily entered and in which she did not make the slightest effort to get a single vote. That shows how close the motion picture is to the people and how responsive and responsible we must be to them. "And going on with our array of actors, there are Claude Cooper, Riley Chamberlin and Arthur Cunningham in the Falstaff comedies; Francis Keyes, Harris Gordon, Morris Foster, Boyd Marshall, Thomas Curran, Wayne Arey and Louise Emerald Bates. Then no mention of our forces is complete without a word for George Foster Platt, director, a man who has had remarkably successful experience both with speaking stage and motion picture productions, whose [stage] career includes such successes as The Blue Bird. He added to the lustre of his fame to staging the Ames productions at the Little Theatre. All this big investment of genius and money is but a means toward the end of better pictures, pictures that shall keep us in the vanguard of the upward movement of the motion picture art. "The future means the development of a new field of writers for the making of feature films. This will force, in turn, just what I mentioned before, the bringing of the stage to the motion picture for material. As a case in point, I may remark that I have been approached and negotiations have been begun for presentation on the speaking stage of The Price of Her Silence, a five-reel [sic; actually four reels] Thanhouser Masterpicture. This one fact points the way on which we are progressing to the period when the motion picture play will be the admitted and recognized fountainhead of dramatic art." Mr. Thanhouser's view of the relative positions of the speaking stage and the motion picture do not come from a one-sided position. He met success on the speaking stage before the motion picture was born and he adopted the motion picture only after he was fully convinced of its future. His speaking stage experience runs back into the days when he had a stock company in Milwaukee, Wisconsin and there pulled the old Academy of Music up from failure to a position of remarkable success. For eight years this Thanhouser stock company played there continuously, with a change of bill every week, and with but 11 weeks of intermission in the whole period. Another interesting Thanhouser success was in stock at the Bush Temple, in Chicago, which for many years was the dramatic center of the north side of that city. Note There he built up a following that brought national attention. Mr. Thanhouser probably can well claim for himself the title of the first theatrical man in America to enter the motion picture business. The great Thanhouser institution of today is a token of the importance of that step. There you have what Thanhouser means on the Mutual Program. The selection of Jacksonville as the location for the Thanhouser Film Corporation's Southern studio is largely due to the efforts of the Jacksonville Chamber of Commerce, which has been working to build up this and other industries in this city for some time. The plant, which is to be located on Eighth street just east of Main, will be the only glass moving picture studio in the South and will be thoroughly up to date in every respect, involving an investment of about $30,000 for the studio, open air stage and accessories. From four to five companies will be at work here, employing from 75 to 100 skilled people all the time and numerous others from the city as supernumeraries. The operation of the studio, it is estimated, will cost approximately $1,000 a day. President Thanhouser of the corporation, while in this city, declared that he had selected Jacksonville in preference to California for the new branch on account of its accessibility to the great Eastern centers. The climate and the fact that pictures can be made out-of-doors the year around, together with the metropolitan advantages of having properties and supplies at hand with little expense, also entered into his decision to establish the plant in Jacksonville. New Rochelle, N.Y., which is one of the most widely known cities in the world, attributes its fame to the establishment there of a number of moving picture studios and the sending out over the world of photoplays incorporating into their scenes the choicest locations about the city. The Thanhouser Corporation, which makes a number of brands of pictures, all of which are among the most popular in this city, was the first to locate in New Rochelle and is looked upon today as its greatest advertising medium. Mr. Thanhouser declared while here that the location of other studios in the city had influenced him somewhat in selecting Jacksonville instead of other cities which were seeking his plant, pointing out that the skilled people employed are always much more content where they can have a social set of their own, getting together and discussing each other and people they know in the profession. He believes that the making of pictures in Jacksonville, showing its choicest and most attractive scenes, will prove one of the greatest advantages the city can have in the way of publicity throughout not only this country but all over the civilized world. He also expects other studios to locate in Jacksonville and foresees the time when this city will become the Los Angeles of the Southeast as a moving picture center, pointing out that Los Angeles and many sections of California hold the moving picture industry above all others in value and revenue.